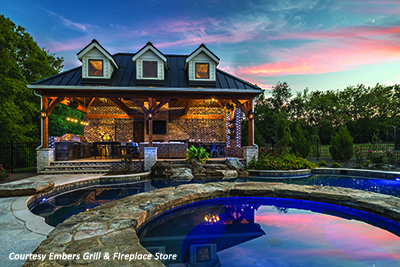 In the past 15 years, homeowners have taken a new look at their outdoor spaces. Today’s private backyard spaces frequently feature covered living space, outdoor kitchens fitted with appliances similar to those found indoors, and upholstered furniture reminiscent of a living room. In the past an outdoor pool may have been open for four months, but the outdoor room is used for eight months or more. Franklin says outdoor rooms continue to grow in popularity and can be found in new construction and in remodels of older homes. Belgard suggests that in creating outdoor spaces that mimic indoor rooms, it’s helpful to apply interior design concepts to outdoor design, and texture plays an important role. Texture adds contrast and balance to a design by visually creating a perceived sense of touch. Interior designers often add textural elements to a design to add visual weight or “pop” to a room. Sometimes when an outdoor room feels incomplete the company reports that chances are, you’re missing textural elements. 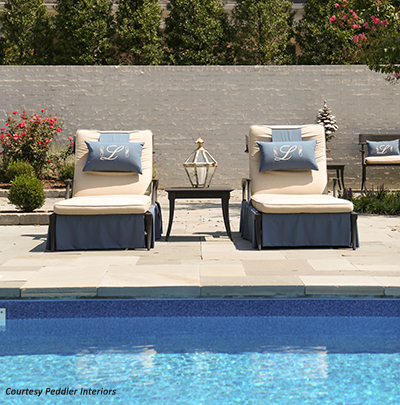 Texture can be added to an outdoor design in a number of subtle and not-so-subtle ways. According to Belgard, an obvious place to begin is with hardscapes, which can serve at the foundation of a design. A number of paver styles that emulate the look of natural stone can provide an organic textural element. In addition, an exterior living space might include incorporating natural stones, wicker, heavy linen fabrics, or textured decorative accessories like pottery or lanterns. Balance texture with landscaping choices like layered gardens, fringy plants, or textured planters. 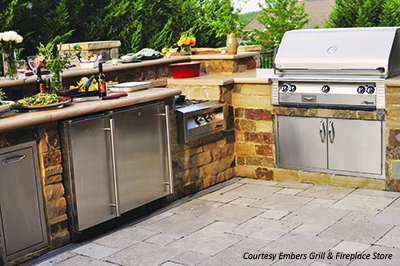 Commenting on the growing trend toward outdoor kitchens and covered porches, Farris says, “These rooms are becoming outdoor living rooms including bringing electronics outside. One of my favorite ways to conceal an outdoor television is an antique shutter box. It protects the television while becoming a piece of wall art. Many of Watson’s clients walk in to the store just wanting a built in grill, but, she says, “After they see all that you can do in a fully functional outdoor kitchen they add more items such as side burners, power burners, warming drawers, teppanyaki griddles, refrigerators, ice machines, sinks, pizza ovens, dry storage pantries, dishwashers, and more.” Embers features an indoor and outdoor showroom with full displays of a variety of outdoor kitchen appliances, brands, sizes, and features.